For those of you who don't follow me on social media, a couple months ago I had really bad back pain and was put on strong painkillers which made attending uni a major difficulty, thankfully my back pain is slightly lesser now but I do still struggle with it daily. I was recently sent this product from Weleda and I am so happy to say that it really helps muscular pain. Weleda Arnika oil is formulated from carefully selected plant oils made from sun-ripened seeds and fruits. The oil is rich in ingredients which help to stimulate the skins own natural revitalisation and regeneration processes. I found the oils to really help soothe any aches and pains I've had in my back through the warmth of the product. Whilst it by no means cures or stabilises my pain, I find that it can ease the symptoms. I like to apply a small amount of the oil to damp skin and massage until absorbed. Helianthus Annuus (Sunflower) Seed Oil, Olea Europaea (Olive) Fruit Oil, Arnica Montana Flower Extract, Betula Alba (Birch) Leaf Extract, Limonene, Linalool, Geraniol, Coumarin. I personally find the scent of this oil quite overpowering and strong. It is very herbal and strong in scent. The fragrance reminds me a lot of lavender and rosemary. However, this fragrance does help to drift me off to sleep when applied after my shower. 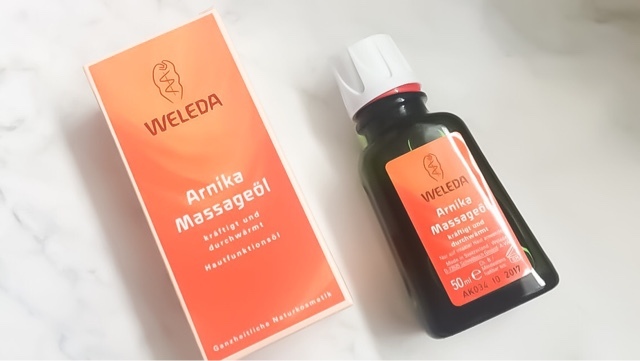 You can purchase the Weleda Arnika Oil from the BeautySpin website. AD | This post is sponsored however all information stated is my own opinion. Please see my disclaimer for further details. Arnica is amazing! It really helps to prevent bruising which is a must for someone clumsy like me! I want to try out this Welda product myself and my Mom (she stands on 12 shifts at clothes mfg and her feet aches afterward)!! I don't mind rosemary scents either but I am glad this help with your pain!